Don’t get us wrong, we absolutely love the Nest Cam IQ despite its sky-high $300 price point. The camera’s flagship feature uses facial recognition to identify whether or not a person in your house belongs there, and it can start recording and send notifications based on who it sees. Of course, not everyone thinks that feature is worth $300. Is it worth $55 though? 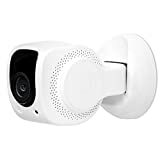 Because that’s how much the Tend Insights Lynx Indoor 1080P Wifi Home Security Camera costs, and it includes an awesome feature that is very similar to Nest’s.